Doubleday & Company, Inc. - Crime Club, 1983. Jacket has original price of $11.95. 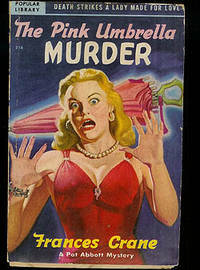 Published for the Crime Club by Doubleday.. Stated First Edition. Hard Cover. Very Good/Very Good. Popular Library, 1943. Small marking in red pencil on first blank page; otherwise very good condition.. Mass Market Paperback. Very Good. Original price of 50 cents on cover. Pages yellowed, otherwise very good condition. "Shadow Against Shadow" by Edward Y. Breese; "Fat Jow and the Demon" by Robert Alan Blair; "A Flower in Her Hair" by Pauline C. Smith; "You Can Bet on Ruby Martinson" by Henry Slesar; "Second Talent" by James Holding; "The Creator of Spud Moran" by John Lutz; "Nobody to Play With" by Irwin Porges; "The Philanderer" by Lawrence E. Orin; "Night Storm" by Max Van Derveer; "Good-Bye Now" by Gil Brewer; "You Can't Fight City Hall, Pete" by Bill Pronizini; What "Difference Now" by Clayton Matthews; "A Nice Wholesome Girl" by Robert Colby; and "Step No. VII" by Harold Rolseth.. Soft Cover. Very Good.